During the 2010-11 season, Nishant Ramela, a good friend of mine and Indian youth football follower described an unknown AIFF XI (now Pailan Arrows) player as very tall, well built and referred by other players as ‘Bush’. However, in the team list I could not locate any ‘Bush’. In those days, Bob Houghton’s Indian team (and Bulpin’s U-23 team) played a style which required tall and well built lads, and so this mysterious figure evoked much interest. Furthermore, there was no I-League telecast that season and AIFF XI players hardly enjoyed media attention, even from most football journalists, thus collecting information was not a simple task. But somehow after a couple of days of enquiries, it was found that ‘Bush’ is the nickname of a central defender called Prathamesh Maulingkar. This player hardly featured in Bulpin’s first XI and thus was an unknown entity. Now two and half years later, having played an important part in Arrows and India U-22, he is well known among Indian football fans. Having joined defending I League champions, one can only hope to see him rise even further. Prathamesh had a quiet first season, but he managed to show his worth from the limited chances he was given. 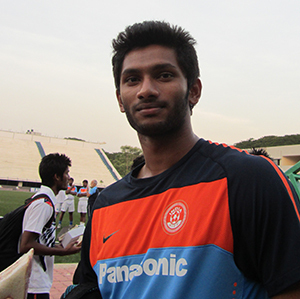 Although players like Raju Gaikwad, Inderpreet Singh and Deepak Devrani were Bulpin’s preferred central defenders, it is worth mentioning that Prathamesh is one of the few (possibly only Indian player) to have earned the man of the match award in his I-league debut (against Air India), and more surprisingly, it was the only match he played that season. Somehow he never fit Desmond Bulpin’s scheme of things. However, Prathamesh was confident about staying with the Arrows. At the end of the season, Prathamesh, speaking to the Goan daily, Oheraldo, said “I have had the opportunity to train with great players and gain valuable experience”. It was further mentioned in the report that he believes his career will develop further with the Arrows. Whether Bulpin had plans for him in the next season is something we will not know because Bulpin was relieved of his position. With Raju Gaikwad and Inderpreet Singh leaving Arrows, the 6’2” tall Prathamesh blossomed under the new Technical Director, Sukhwinder Singh. Prathamesh became a regular in the central defensive pairing mostly with Deepak Devrani (Shouvik Ghosh used to be a full back in most matches). Sukhwinder, as we know, prefers a defensive game with a solid defence and thus Prathamesh got huge exposure. Although Arrows had a forgettable season, the defenders were frequently praised, Prathamesh being one of them. As the season ended, Prathamesh got a call in the India U-22 team, and there he met newly appointed Aussie coach Arthur Papas. In an interview with AIFF’s media team, Prathamesh mentions his experience of playing under Papas’ India U-22 as something which gave him a lot of confidence and ‘changed him as a player’. Prathamesh, who was recovering from an injury when the AFC U-22 championship qualifiers had started, made his international debut against Iraq U-22 and also featured in the game against UAE and Oman. Playing under Papas was not the same as playing under Bulpin or Sukhwinder Singh. Papas changed the way the team plays, stressed more on ball possession. In his team, even the defender and goalkeepers are not expected to hoof the ball forward all the time. Prathamesh, recalling the initial days with Papas, says, “When Papas took over and showed to us what he wanted, we found it hard to believe we could play that way. If you look at the earlier years, though we performed well, we were groomed in a different fashion. Hence, we had our apprehensions. But we realised fast Papas was stressing on the basics and henceforth, adapting was no more a problem…. I can tell you, we are getting better day by day”. In the ongoing season, playing for Pailan Arrows, he remained as an important member of the squad. However, injuries, fitness issues and its usual cycle of recovering fitness and form have seen him in and out of the first team. Hailing from Tivim, a village near the Northern Goan town of Mapusa, Prathamesh hardly had ambitions of playing as a professional footballer. In fact, like most Indian kid, he was more interested in being a cricketer, although he had shown qualities of a footballer early, making it to the Dempo U-16 team. However things changed when he represented Goa U-19 in the junior nationals. Playing against boys of same age group from other states, he realised that he has the potential to play along with the best in the country. Suddenly, he became motivated and focussed more on Football. During this time he remained in Dempo youth team, represented them at U-19 level. He was also called up for India U-19 camp. Later his selection in AIFF’s developmental program (AIFF XI/Arrows) became instrumental in his development as one of India’s upcoming young defenders. Recognising AIFF’s contribution in his development, Prathamesh mentioned in an interview, “It is because of Arrows, I am what I am today. There’s no other way other than thanking them from the bottom of my heart……In 2010 when Arrows were formed, some of us may have been roped in by clubs but it was an open secret they won’t ever get a chance to play. Ever! In such a situation, Arrows gave us the perfect platform to play in the I-League. What more can you ask for? We were all U-19 boys at that time but we got to play regularly”. Dempo, this season, has been inconsistent, and are certainly looking to change some of the older players with youth. Defensive woes have certainly troubled the reigning I League champions and injuries to important players like Mahesh Gawli has multiplied the trouble. 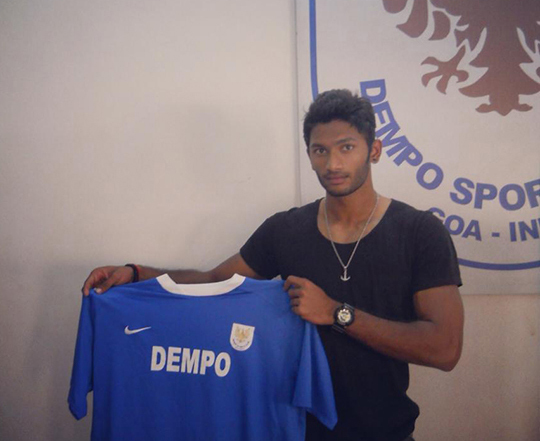 Thus, Dempo made a bid for 21 yr old Prathamesh (he will be 22 this April), who although young, was now an Arrows veteran. Every Arrows player needs to leave the system to join the ‘bigger boys’ of other teams. However, it can’t have been better for Prathamesh, who has been a part of Dempo’s youth teams; for him it is a second homecoming. Arrows management, with Prathamesh’s future as priority, allowed him to join the Goan outfit on loan. It is understood that after his loan tenure finishes, he is likely to sign a contract with Dempo. In sports, especially in football, fan following and popularity doesn’t exclusively depend on the performances in the field alone. The glamour factor plays a big role in attracting fans and attention (although not without the on-field performances). Indian footballers, in general, don’t seem to be too comfortable in this front. 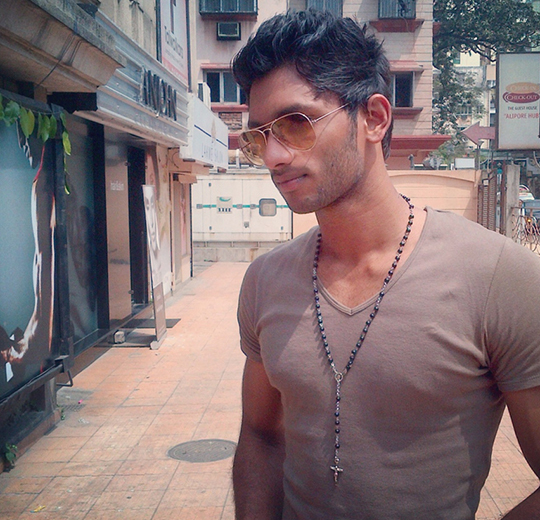 Prathamesh is one of the rare, but fast emerging, breed of Indian footballers who are smart and stylish. Although he constantly works hard to improve his performances, his style quotient hardly needs an improvement. Armed with ‘bad boy’ looks and hunky physique, style comes to him naturally. Importantly, it is not just style without substance. Having chatted a few times with him after the practice sessions during of India U-22 camp, I can say that out of most players I had talked to, this guy looked most ‘at ease’, comfortable and carried on the conversations smartly without any awkwardness. Who knows, maybe after Sunil Chettri (featured in Maxim and Men’s Health) he can also make it to the pages of a magazine, something which Indian football fans would love to see. Well, if that happens, it certainly needs to be preceded by consistent performances. Can he rise in Dempo? What now remains to be seen is whether he can make it to Dempo’s first team successfully? Playing for Dempo is certainly different for playing for Arrows. While Arrows aim solely towards developing players, Dempo has its eyes on trophies and results. Playing for a bigger club is certainly not as, easy Nicholas Anelka has once said, “It’s difficult when you are playing in a big club and you are very young. You never know what’s happening inside the club, or inside your life. And they expect you to be good all the time”. Prathamesh is certainly under no illusion about this, he said in an interview to AIFF, “I know, I may not get a start immediately but I will wait for my chance and prove myself whenever I get it.” At the same time he also needs to take extra care of his fitness. Injury is something which has been troubling him from the last season. Though he had minor injuries, they seem to come back from time to time, unsettling his rhythm and his place in the team. Many players from Arrows have made a place for themselves their respective clubs, some of them being Jeje, Jewel, Manandeep, Gurpreet, Raju, Lalrindika; with age and right experience behind him, there’s no reason why Prathamesh can’t do the same. i need a help from you…..iam 17yrs old….6ft height,plays in central defender…i practising in a camp in rabindra sarobar stadium….i just want to give a trial in pailan arrows in my age group….i think it iss right time for me..i amgoing through hard time….if u r reading this then please try to help me……i know i can do it but just need a help…..waiting for your reply…..